CanX-3 (Canadian Advanced Nanospace eXperiments), also known as BRITE (BRIght-star Target Explorer), is a mission planned to make photometric observations of some of the brightest starts in the sky in order to examine these stars for variability. 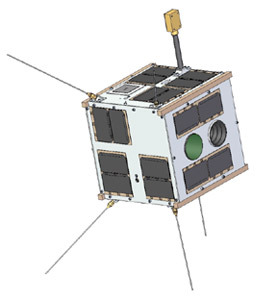 The observations will have a precision at least 10 times better than achievable using ground-based observations, and it will be packaged inside a CanX-class nanosatellite. The Principal Investigator for the BRITE mission is Professor Anthony F. J. Moffat Département de physique, Université de Montréal. The Austrian Co-Principal Investigator is Professor Werner W. Weiss, University of Vienna. The design is a 20 cm cube, chosen to accommodate the main telescope. It leverages a number of technologies qualified on CanX-2 and incorporates SFL's high-performance attitude control system, using reaction wheels developed in collaboration with Sinclair Interplanetary. With the support of ETech a preliminary design for BRITE has been completed. At the present time, the components to be integrated into the science instrument are being evaluated at UTIAS/SFL; this stage of the work is supported by the Canadian Space Agency.